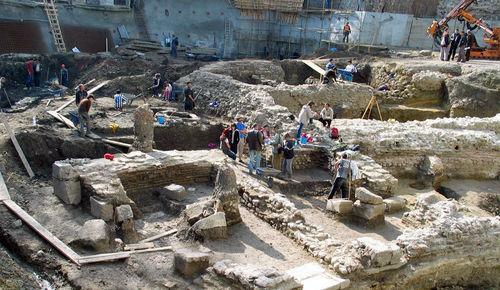 - BULGARIE : Kastritsi - Archaeologists from Varna discovered one of the largest medieval treasures in recent times and the largest one in 2010 during excavation works in the medieval city of Kastritsi in Euxinograd. The treasure was discovered embedded in the floor of a home within the medieval stronghold. The treasure consisted of a small jug dating back to the 14th century, containing 166 silver coins from the era of Ivan Alexander of Bulgaria and his son Mihail. The archaeologists also unearthed parts of utensils and swords. - MEXIQUE : Mexico City - The largest recovery of cultural property that had been illegally removed from churches and archaeological sites in the country, some for the last nine years, was unveiled today by officials of the National Institute of Anthropology and History (INAH-Conaculta) and the Attorney General the Republic. These are 14 colonial religious art works and 144 original pre-Columbian pieces, plus another 36 that are false. - CAMBODGE : Despite the measures taken by the Cambodian government to protect its 2,000-year-old Khmer heritage, the widespread looting and destruction of archaeological sites continues. The first Red List of Cambodian Antiquities at Risk published on the internet by the International Council of Museums (ICOM) details 46 categories of object. 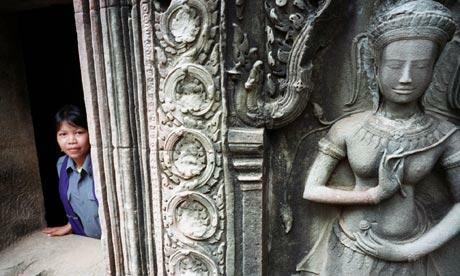 Apart from Angkor, attempts to prevent looting have had little effect. "The prehistoric past of Cambodia remains largely unexplored and undocumented," ICOM explains on its site. "The looting of sites from all periods of Cambodia's past robs the world of the chance to understand the unique beginnings and continuous evolution of the Khmer civilisation." - U.S.A. : Timbuctoo - These are crushed fragments of a past life when free black people lived in this New Jersey community almost 200 years ago -- free even then, 45 years before Emancipation. Timbuctoo was founded by freed blacks and escaped slaves in the 1820s. It was probably named after Timbuktu, the town in Mali near the Niger River. Based on a geophysical survey, archaeologists believe that foundations of a whole village of perhaps 18 houses and a church dating back to the 1820s lies beneath layers of dirt. - ROYAUME-UNI : Brodgar - Archaeologists on Orkney have discovered the first evidence in the UK of stonework painted with a pattern. It comes a week after the researchers, working at the Brodgar peninsula on Orkney, found plain painted stones thought to be around 5,000 years old at the spot. The site, described as a possible Neolithic temple precinct, is between the Stones of Stenness and the Ring of Brodgar. The latest discovery is a stone with a zigzag chevron pattern in red pigment. It is thought the painted and decorated stones may have been used to enhance important buildings and may have been found in entranceways or areas of the building which had particular significance. - U.S.A. : Etna - The field being excavated probably served as a fall and winter camp for a small family group from the Hopewell culture. Brown and fellow archaeologists uncovered postholes that once would have supported a primitive hut or wigwam, as well as a fire ring and pieces of poorly fired clay pottery. That's in addition to the pieces of flint, which are remnants of prehistoric tools that would have been brought from the Flint Ridge area of eastern Licking County or spots farther east. 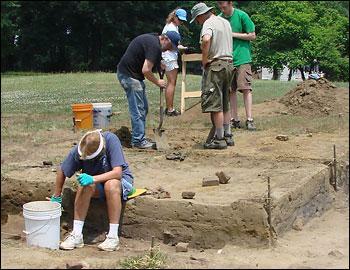 "We're seeing a lot of artifacts that date back to the Hopewell Period," Brown said. "A rough guess is that the site is 1,500 to 2,000 years old." - ALLEMAGNE : Berlin - When an incendiary bomb hit in World War II, Berlin's Tell Halaf archaeological museum went up in flames and its 3,000-year-old statues were smashed to smithereens. It has taken nine years of piecemeal work, but 60 artifacts have now risen again, phoenix-like, from 27,000 fragments of stone found in the ruins. The ancient treasure -- monumental deities from Aramaean civilisation and relief slabs depicting hunting scenes -- will soon be back on public display. A century after it was first discovered in the Syrian desert and nearly 70 years after its bombed and broken shards were dumped into crates and buried anew in the cellars of Berlin's Pergamon Museum, the story of its salvation is itself an unlikely tale. "We have reconstructed more than 90 percent of the artifacts from the Tell Halaf museum," said German archaeologist and restoration manager Lutz Martin. - ROYAUME-UNI : Londres - A scrap of muddy terracotta found on a bank of the Thames has provided a rare glimpse of the grandeur of medieval London before the Great Fire. The roof finial, up to 800 years old and in the shape of an animal, would have decorated a grand tiled roof at a time when most people lived under thatch. It was found by a mudlark – one of the small army of amateur archaeologists who scour the beaches and mudflats of the river at low tide. The finial is a rare find. The fire of 1666 obliterated much of the medieval street pattern and led to changes in building regulations to prevent fire spreading again with such disastrous speed.